While the DC movies are struggling to introduce any idea bigger and wilder than "Batman has co-workers," the DC TV shows are over here diving head-first into the concept of the multiverse. 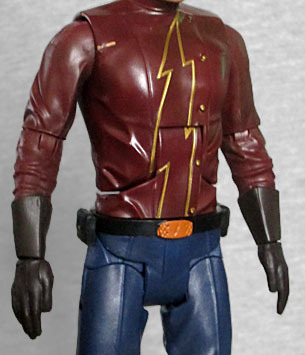 Mysterious speedster from Earth-2, claiming to be our hero - but is he really who he claims to be? Okay, if even the packaging is going to get into spoiler territory, then we're not going to hold anything back. But first, some backstory: in the '90s, Mark Waid wrote a story titled "The Return of Barry Allen"; in the story, Wally West was surprised to find that his former mentor, who had died during Crisis, was apparently back. It eventually turned out that "Barry" was actually Eobard Thawne, pre-Reverse Flash, traveling through time and suffering a bit of amnesia. In introducing Earth-2, the Flash TV show took a cue from that story, making the guy who introduced himself as Jay Garrick secretly be that world's Professor Zoom. The funniest part was that Mark Waid got mad at the show for doing it - not because they were aping his story, but because he failed to recognize the inspiration, and thought they were legitimately making Jay a villain! 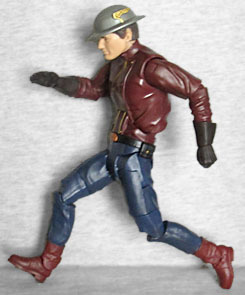 Since this figure represents the fake Jay Garrick, not the real Jay Garrick, it has the face of Teddy Sears, generically handsome man. It's a decent likeness ("quite good" by Mattel standards), though his hair looks weirdly flat. Here's a strange fact for you: in 2005, a struggling young Teddy Sears appeared on Letterman where he played... Batman. Guy's got a history of pretending to be heroes! Of all the CW shows, Flash seems most willing to revel in its characters' comic origins - Arrow keeps making its people look like they belong in the X-Men movies or on Agents of SHIELD, but Flash isn't afraid of color. Usually. At any rate, Jay's costume may be slightly desaturated, but it looks astoundingly like it does in the comics: red shirt, blue pants, red boots. They even kept the big silly lightning bolt that comes up out of his belt! Now, yes, his "shirt" is actually a thick jacket, and he wears gloves that were never in the books, but this is still a very true-to-life look for him. The articulation is, as you'd expect, completely halfassed. He has joints at all the usual places - neck, shoulders, elbows, wrists, torso, waist, hips, thighs, knees, and ankles - and like almost all Mattel product, the joints are engineered just badly enough to feel like they're nearly worthless. Plus, the Gentle Giant digital sculpt is of the old, soft, "RealScan" variety, making this figure, like all Mattel's live-action toys, less than impressive. We do get a little bit of variety in his appearance, thanks to swappable hands (fists or flats), but there's still a long way to go before we could call this a good toy. 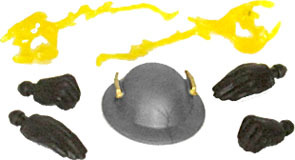 Flash's accessories include the same lightning bolt wrist effects we've been getting since DCUC2 - they're yellow this time! Also, his trademark helmet (another feature the show's costume department copied unabashedly) is removable, which is both a new feature and entirely unexpected. So good on them! 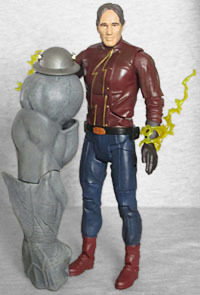 Of course, he's also got a piece of the King Shark BAF, the right arm. Which, measuring from fist to shoulder-ball, is just as tall as Flash is from boots to armpits. Mighty huge! I still need to find Zoom and Batgirl before I can finish the big guy, and I really hope they show up soon, because he looks like he's going to be fun! The Flash's take on The Flash of Earth-2 may be a decidedly awkward sentence, but more that than, it was an interesting twist on a very familiar old story, and the character's costume is a great homage to the comics. If only the toy were made better!